Clean air and carbon reduction objectives mean we have to factor in the CO2 balance and the pollutants produced by transportation all the way “from the well to the wheel”, in other words from capturing the primary energy at source, through its conversion into secondary form of energy, to its expenditure via the vehicle’s roadwheels. It also requires reconciliation between the method of exploiting the secondary energy and the use made of the vehicle. The production of liquid or gaseous fuels from renewable resources for use in current and future combustion engines is environmentally promising. 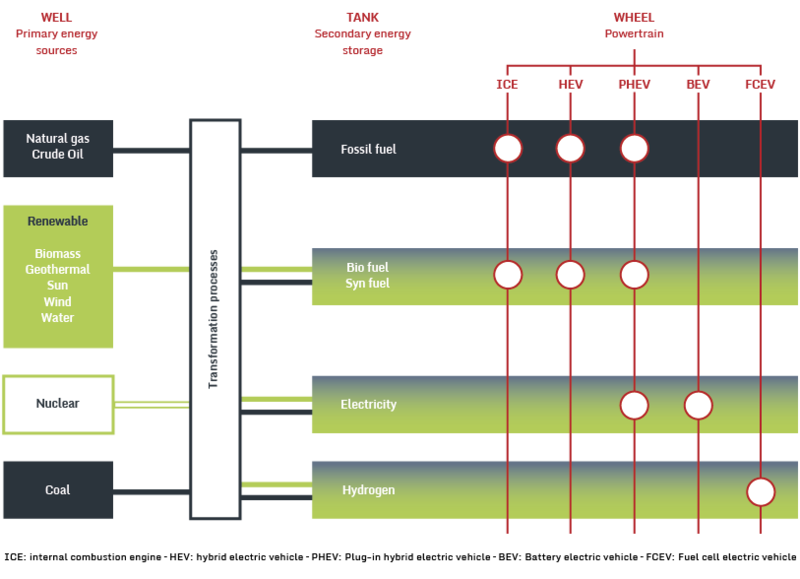 Biofuels from biomass, “Synfuels” made from synthesized hydrogen produced from renewable primary energy sources and sequestered industrial CO2, and straight hydrogen all are candidates at various stages of appraisal. For secondary energy to be truly clean, it has to come from a clean primary source. The fossil fuels used today for energy production would need to be replaced by renewable energy sources (wind, sun, water, geothermal). Since these are by their very nature intermittent, they could no longer be modulated to make production match consumption. Huge amounts of energy would have to be stored and we have not yet found an effective storage solution. The well-to-wheel environmental balance of the electric car will therefore be a long way right of neutral for several decades to come, continuing to depend on the energy mix used to generate the electricity. As things stand, the well-to-wheel CO2 and pollutant emissions of an electric vehicle in regions where the primary power generation fuel is of fossil origin are equivalent to or even higher than those of a vehicle using a latest-generation combustion engine. In addition, batteries and electric motors use rare, expensive, non-renewable materials, whose very extraction is not what you would call environmentally friendly. Their very localized concentration also raises the problem of strategic, geopolitical dependence when production of very large volumes is being envisaged. The electric vehicle is well suited to short-range use. In addition, it has the advantage of shifting pollutant emissions away from urban concentrations and significantly reducing noise, making it a vehicle eminently suited to urban and suburban travel. The electric vehicle will however remain an inefficient solution for long-distance use in both economic and environmental terms (weight and cost of long-distance batteries used occasionally vs. lighter and cheaper batteries for short-distance, everyday use). Liquid or gaseous fuels of fossil origin, gradually giving way to renewable origins (biofuels, e-fuels, hydrogen, etc. ), will continue to be the preferred long-distance solution for some time to come. The internal combustion engine is and will remain an efficient, effective solution for converting this energy on the road. Forecasts for the electric/combustion vehicle mix up to 2030 and beyond vary widely from analyst to analyst. However, in all scenarios, on this horizon the majority of vehicles will be fitted with an internal combustion propulsion system, with or without an electric element (hybrid). Given that ICE vehicles will remain in the majority for the foreseeable future, improving the efficiency of combustion engines is essential to meeting future environmental standards.  The consensus of the automotive industry identifies two main routes to this: charge dilution (ultra-lean mixture or exhaust gas recirculation) and the use of extended expansion cycles (Miller) with variable or fixed compression ratios. In the latter case, mild hybridization will be required in the short term to comply with 2025 regulations. It is not the engine that will make transportation clean and carbon neutral; it is the combination of primary and secondary energies used. There will not be a single solution as there is today; the solution will depend on the type of use. The chosen solutions must be applicable worldwide in order to lower costs and ensure interoperability. By 2050, there will be two main kinds of passenger vehicle: the first one dedicated to “short distances”, using electricity only as the secondary energy; the second one, compatible with both “short distance” and “long distance”, will use two types of secondary energy: electricity and a new secondary energy to be developed for “long distance” use. The relative proportion of combustion-engined and electrical vehicles will be strongly influenced by the actual availability, cost, and reliability both of carbon-neutral fuels and batteries and of the energy production and distribution infrastructure.